We’ve all been trying to stay dry, and Simon’s now a daddy. What next? . Michi, Matthew and Charlie played as Swell Park Schism back in November, and people seemed to like it, so we’re bring the nyckelharpa back to Lewes, this time for an evening with our friends Stella Homewood and Twenty-One Crows. We last played with Stella at Songs to the River, and she lent her exquisite voice to several tracks on the Small Shipwrecks record. Stella’s just completed her second album, The Wild Places, and we’re excited that she’ll be launching it at this show. We’ve wanted to share a bill with Brighton-based Twenty-One Crows for a long time. Uncut magazine says they “spin dense and stirring tales of war, death and God against a backdrop of immaculate Pete Seeger-inspired folk,” which is pretty much a perfect Saturday night out in our book. If it sounds like your kind of Saturday night too we look forward to seeing you there. In November, the magpie cracks a weary tune. Join us for an autumnal gathering at the Brunswick in Hove, featuring Jaime Regan and the first outing of Swell Park Schism – that’s Matthew, Michi and Charlie of Small Shipwrecks. We shared a bill with Jaime at Songs to the River back in June (and Michi shares a stage with him all the time, as part of the So Last Century String Band). Jaime’s got a knack for haunting melodies matched with country rhythms (think Bon Iver and Band of Horses). This year he released his second solo album ‘Winterborn’, which you can hear performed by Jaime’s full band on the night. With Small Shipwrecks taking a break from full line-up shows until next Spring, 3/5 of the band are taking the chance to try out some new songs in front of an audience for the first time. 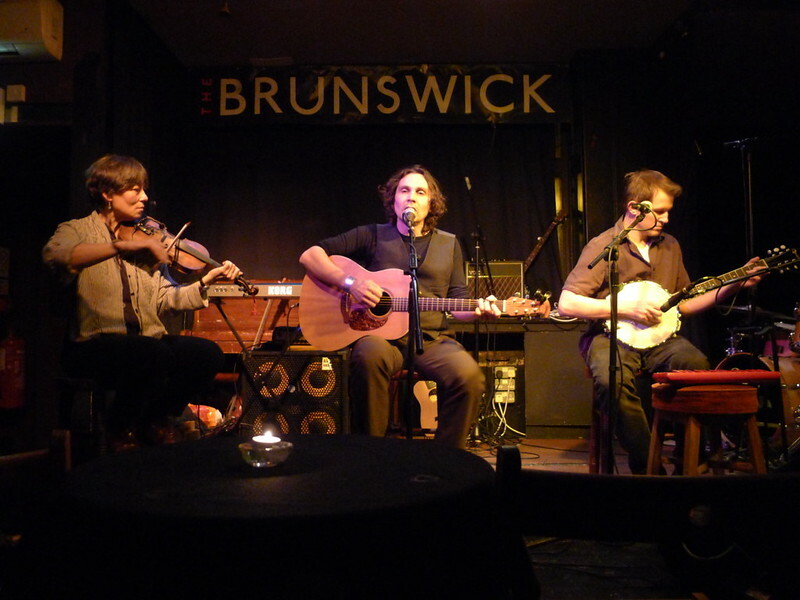 With guitar, six-string banjo, fiddle, nyckelharpa and minimum viable glockenspiel, you can expect to hear a handful of new tunes alongside and a couple of recent additions to the Shipwrecks live set. We’re getting excited about finally playing the Brunswick in Hove, particularly as we’re sharing the bill with Thea Hopkins and Gill Sandell. Boston-based Thea is on a short UK tour following the release of her Lilac Sky EP earlier this year. Promising ‘a fresh stamp on Americana’, stand-out songwriting and a voice with ‘the mystery and power of… Nick Drake’, it’s great to be supporting her. It’s brilliant that we’re being joined by Gill Sandell – singer/songwriter; also pianist, flautist and accordionist with Emily Barker & The Red Clay Halo. Gill’s playing the only Brighton date in the tour for her lovely album Light the Boats, which launched this week – it’s worth coming for that alone. We’re all geared up for this weekend’s Uncivilisation festival in Hampshire (15-19 Aug). Not your average festival; it promises to be a fascinating and thought-provoking weekend of writing, music and conversation, all in a beautiful setting. Saturday’s fully-acoustic music line up is curated by marvelous band-chum Chris T-T, who’s kicking things off himself at 6.30pm. We’re on at 7pm, followed by Matt Wicking, 30 Pounds of Bone, Grace Petrie and an intriguing secret special guest headliner. Don’t be fooled by today’s crappy rain, this weekend’s going to be perfect festival weather, just in time for Meadowlands. Various Shipwrecks will be at the festival on Saturday, and we’ll all be there for our slot on Sunday: 2pm on the Woodland Stage. It’s going to be great. 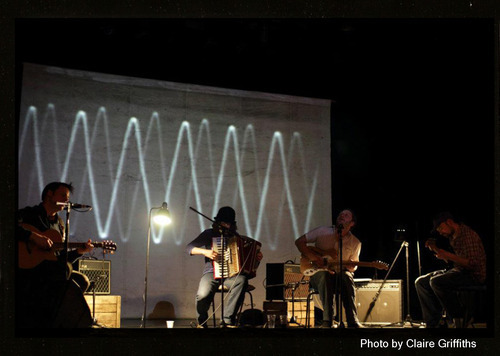 Saturday’s highlights include Sweet Billy Pilgrim – beloved by Simon and Charlie – and fellow Lewesians The Self Help Group. On Sunday there’s an early slot from the lovely Straw Bear (12pm, Sound Harvest Stage) and a 10.15pm slot on the Woodland Stage for Fire Eyes (featuring Farah’s fellow Josephine, Maria). We’re told there are a handful of tickets left, and that they’re cheaper online than on the gates. You can buy for the weekend, or just for the day. Later tonight we’ll be appearing live with the good people of Folk is Not a Rude Word on Uckfield FM. They’ve invited us in to play a few live songs and to chat about ourselves and some of the other bands we love. It would be lovely if you want to join us live from 9-11pm on 105FM, or via the live feed at the Uckfield FM website. If you fancy posing any questions please send them to @fnarw on Twitter. Only one gig in May but it’s a good ‘un – we’re on at Meadowlands, our home festival! It’s a three-day festival at Glynde Place, Lewes, from 24-26 May, and the headliners include British Sea Power, The Herbaliser and the bloody marvellous Sweet Billy Pilgrim. We’re playing the Woodland Stage at 2pm on Sunday 26 May. Weekend tickets are £95 including camping, or you can buy a Saturday/Sunday-only ticket for £48 (includes camping that evening). We’ll be warming up with a live set on Folk is Not a Rude Word the Wednesday before. More on this soon! If you’re not all completely sated with music after Record Store Day, how about coming along to our gig today (Sunday 21st April)? 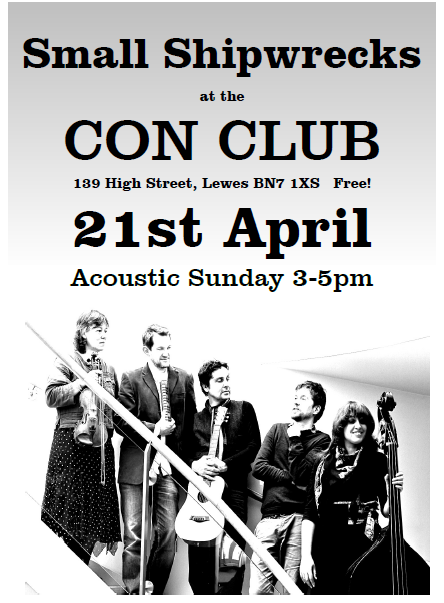 We’re playing from 3-5pm this afternoon at the Con Club in Lewes. It’s free to get in, and the long set means we’ll be playing everything we know – and probably some we don’t. We’re hugely looking forward to Friday night, when we’ll be supporting the magnificent Caramel Jack at the Prince Albert in Brighton. Also playing is Laura Ward & the Risen Road. Doors are at 8, and we’re on first at 8.30. You can get advanced tickets for £4 but hurry as there are only 10 left. Otherwise it’s £5 on the door. See you there!